This year’s 2nd annual Brita Climate Ride and “climate conference on wheels” will see 200 cyclists pedal 300 miles from New York City to the US Capitol in Washington DC to raise money and awareness to fight climate change. The ride takes place from September 26 to 30, 2009, and benefits critical projects at three climate and bike-related organizations: Rails-To-Trails Conservancy, Focus the Nation, and Clean Air – Cool Planet. The ride is an unforgettable experience and a unique opportunity to be part of the movement. 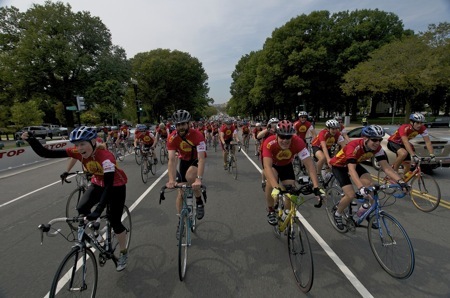 The picture below shows Climate Riders biking into Washington DC during last September’s Brita Climate Ride. Climate Riders are renewable energy experts, green organizers, environmental leaders, and everyday citizens coming together on a beautiful 5-day bike ride to tackle global warming, and learn about solutions to the climate crisis and how to transition to a new energy future. At the end of the event in Washington DC, climate riders will meet with their congressional representatives to summon a new natural resource: the collective political will to actually affect change in our nation’s capital. Alison Gannett: world champion free skier, Patagonia Ambassador, founder of the Save our Snow Foundation, and star of Warren Miller ski films. Alison will be pedaling with the Climate Riders all the way to DC! In her free time, Alison converted the 1st Solar-powered SUV PHEV in the world to get 100+mpg. This amazing athlete also leads ski expeditions to Pakistan, Bolivia, Bhutan and India to document global warming. Check back with us at www.climateride.org to learn who else will be pedaling from NYC to DC. Brita Climate Ride is the first multi-day, multi-city charitable bike ride that showcases the bicycle as a viable solution to climate change and the only such event that benefits climate and bicycle-related organizations. Riders pay a $100 registration fee, and then raise $2,400 to participate. The ride is fully-supported by a team of talented leader-hosts, bike mechanics, medics, and massage therapists. Climate Ride is also one of the ‘greenest’ multi-day charity ride events in the world. Riders are asked to bring no bottled water (recyclable water bottles will be used, and filtered water will be provided by the title sponsor Brita). There’s no disposable plateware or cups, the support vehicles are hybrids and vans that run on veggie grease, and every effort is made to recycle and compost materials used on the ride. Registration is now open and riders can sign up or find out more information at the Brita Climate Ride website: www.climateride.org. Join us as we drive the ultimate carbon-free machine: the bicycle!